The Skinfood Black Sesame Seed Hot Mask is one of the most popular products in Skinfood. Contains Vitamin C, proteins, yogurt ingredients, and 100% natural black sesame which provides moisture and nutrients to your skin. 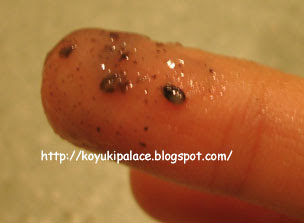 Black sesame contains charcoal salt and sugar powder, which gives your skin a warm feeling. That's probably why it's known as a "hot" mask. It increases blood circulation, opens pores, deeps cleanses, and reduces the formation of black heads. Very strong black sesame smell! I accidentally tasted it and it's so sweet, almost tasted like black sesame paste (dessert). It's totally suitable for the winter time since the mask becomes hot right after you applied it onto your face. The only thing I don't like about it is that it's a bit runny... if you put too much on your face, it drips down your chin.... but it works as a good exfoliator, cleanses really well. My skin is super soft and radiant after using it. I'll probably get this product again if I go to Korea. Instructions: Clean your face and apply mask onto damp skin (avoid eyes and lips area). Massage for 3-5 minutes and wash with warm water.